Throne of Glass by Sarah J. Maas. Bloomsbury USA Children's; 2013. 432 Pages. Ebook. I loved the characters, the setting, the plot, the writing - everything. 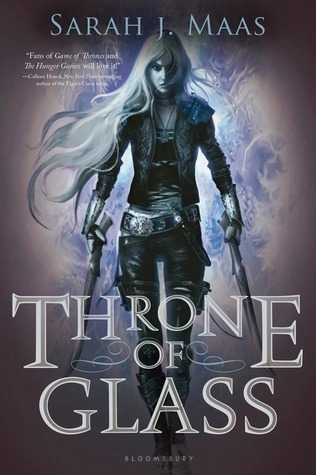 In Throne of Glass, Maas has created an entirely unique and exciting new fantasy world that draws you in and ensures that you will want to keep reading. I am such a sucker for some good, witty dialogue. It brings such life to the story and the characters, and makes them appear much more real to me. Maas provides excellent banter between Celaena, Dorian, and Chaol, and it's wonderful. And you know another reason I love witty dialogue? It keeps me hooked. It keeps me reading page after page without realizing I'm reading that much. To me, that is the sign of a good book. But it was more than just dialogue that kept me hooked on Throne of Glass. It was the setting and the plot, also. This had such a unique premise to me, and I think that is also what really enticed me with this book. I enjoyed reading about the various challenges that the champions had to perform in, as well as reading about Celaena's own personal life and struggles with herself, the people around her, and the political frustrations. Everything melds together and provides a very harmonious plot and conflicts. The characters are also wonderfully portrayed. They have extreme depth and undergo a vast amount of development. Celaena herself undergoes so much change in just this novel alone. She arrives from a prison camp, where he has been brutally kept and beaten, forced to work hard with little to eat, and no shelter from the elements. Understandably, she is cold; she is emotionless, and she does not want to be at the palace. However, as the novel progresses, so does Celaena. We begin to see more sides of her. She does not ever completely lose her outer shell of protection that she has formed, but we learn understand her and her need for such protection. Another wonderful thing about Maas' portrayal of Celaena is that even though she is an extremely powerful, terrifying assassin who could kill you before you even know what's happening, is that she's relatable and realistic. She loves books, for goodness sake! She loves food, she whines and complains. Overall, I immensely enjoyed this book, and would recommend it to just about everyone. It will receive the magical five-star rating from me.